I'm not looking for any specific product recommendation, but I'm just curious in terms of type of hardware which has been proven as the most efficient in terms of mining Monero. Is it GPU, CPU, ASIC, or is there anything else? There are financial risks associated with mining cryptocurrencies. These risks can be related to changes in exchange rate of the cryptocurrency or to changes in the algorithm that is used to mine the cryptocurrency. Please deliberate well before making a purchase because we will not accept any requests for refund for orders of this batch. "Overview - This is the v0.12.0.0 point release of the Monero software, and it is part of the v0.12 network wide update. This major release is due to the April 6th network update, which in turn increases the minimum ring signature size, sorts inputs so as not to leak wallet choice by inference, and slightly changes the proof-of-work algorithm to prevent DoS attacks by ASICs.". So those results are more theoretical than practical, but it's the fastest hardware. Patrick at STH mines Monero when his Servers are underutilized, to pay for operating costs. He has lots of Equipment on hand and regularly tests new Setups and updates this Thread: https://forums.servethehome.com/index.php?threads/monero-mining-performance.12116/ . He doesn't test ASICs or FPGAs; which once both constructed and provided with the necessary Software are certain to be faster. Currently FPGAs with AES-NI and the necessary Memory are available but there's no Software (for Monero, there are Dev Boards and SDKs if you are inclined). Currently there is no GPU Card and Software that beats a CPU. Currently x86 CPUs lead the way, the Fujitsu SPARC64-M3 and IBM POWER9 are faster and available CPUs but there isn't mining software developed for them to the same extent (and optimization) so other Architectures don't "lead" but they could. It is possible put the Intel 8180 on an 8-way (socket) Motherboard, once someone makes one, while AMD's CPU is limited to 2 sockets. Buying 8 Intel 8180's will cost $80K while 2 AMD 7601's (with motherboard) should cost under $10K. So, CPU now and probably FPGA soon, ASIC when it's worth it (and they incorporate large and fast Memory that's tightly coupled to the processing that implements AES - so, not "soon"). Short version: You need a big L1. Barreleye POWER9 Hardware is available, but you'll be writing some Code or recompiling existing Source (with non-optimal performance). With CAPI 2.0 it will accept NVidia Volta Cards (with NVLink 2.0). 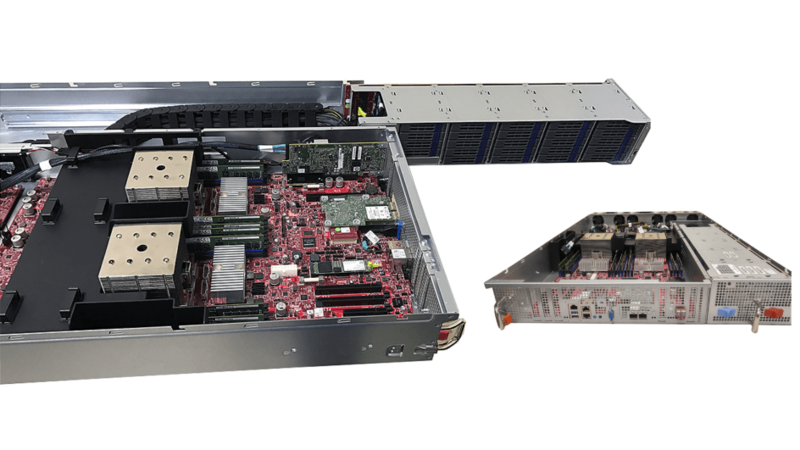 It has 48 PCIe G4 Lanes and the 120 MB L3 runs at 7 TB/s with 512K L2 per SMT8 Core. On-Chip Acceleration for AES/SHA2 (and many other things, along with support for outbound Accelerators). Each NVLink 2.0 lane in the Power9 chip will communicate at 25Gbps (bits per second), seven to 10 times the speed of PCI-Express 3.0, according to IBM. Power9 will have multiple communication lanes for NVLink 2.0, and they could provide massive throughput when combined. You'll need to be ORNL to get one" - but that's an exaggeration, it's OpenCompute (plenty of Vendors, Source, Help - but sell your inexpensive Car). This is first rate Server Hardware. In terms of power efficiency, the reigning champ was the Nvidia 750Ti. That GPU will get you 250H/s and use about 30-40W power. For efficiency, that puts it around 6H/s/W. With the optimized ARM64 code I've been working on, a small ARM64 box (like a high end TV box) can get you 22H/s using less than 5W power. Much slower mining, but much higher efficiency, at 4.5H/s/W. There are no ASICS yet, and GPUs are about 2-4x faster than CPUs. Monero's PoW algorithm has a large memory requirement that would make it difficult to use an ASIC and less advantageous to use a GPU over a CPU than in Bitcoin. People visiting this question in the future will find the answers provided are out of date. This website lists user-submitted hardware benchmarks that include Monero mining hashrate, power consumption, and configuration settings. The creator told me they were adding features to make it easier to search and sort the data. It's worth mentioning that the mining hardware with the highest raw performance is an ATI/AMD 290X or 390X graphics card, earning 750 H/s or more. However, they are not nearly as efficient as the Nvidia 750Ti mentioned earlier. Currently the rx400 series is the most efficient, powerful, and cost-effective mining equipment. I have gotten an rx470 to 700 h/s using about 80-90 watts. It required many hours of bios modification, but this is all doable with readily available software. This depends on whether you refer to "performance per watt" or "performance per purchase price". etc. From what I can gather, in terms of performance per watt (or, performance per power bill, if you want), the Xeon Phi is best. 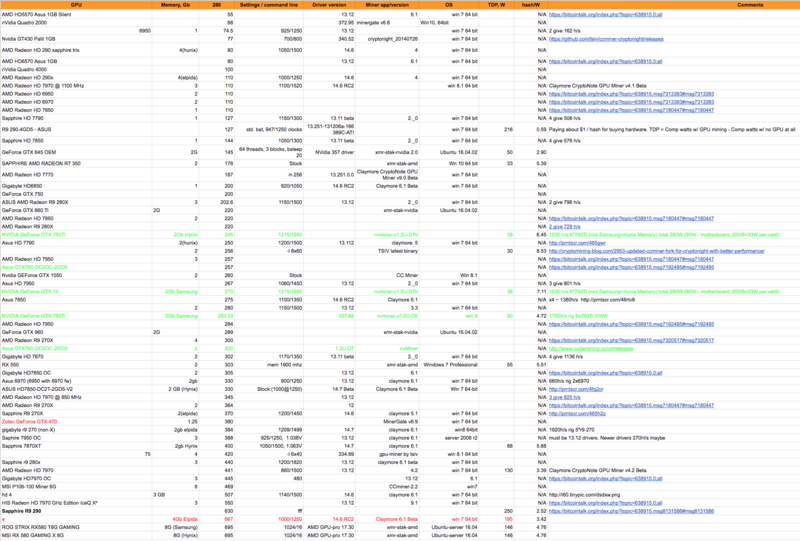 This Google docs spreadsheet has a nice list of GPU/CPU hash rate reports to help you make up your mind! The most efficient hardware for mining Monero, at this time, are AMD GPU cards. High hashrate power and low power consumption is the perfect combination. Truly, the more cost-efficient hardware for Monero mining is the AMD Radeon Vega card. Both 56 and 64 VEGA cards are notably profitable in mining Monero. Radeon VEGA 56 can mine with stock BIOS around 1850 H/s at ~140W. Radeon VEGA 64 can mine with stock BIOS around 2050 H/s at ~160W. On r/MoneroMining, you can find all the instructions to make VEGA performing that values. Apart from VEGA cards, the RX series is also efficient in mining Monero. RX550 and RX560 have very low power consumption and RX570/RX580 can do (with BIOS modifications) around 1000H/s at ~100W. I think for monero that ram is very important, and the clock speed of the gpu is less so. I have a rx470 and it is very good, I will change the bios for major fixed parameters for mining. Most powerful hardware is to use GPU and CPU. Read also: Best CPU Mining Guide for Crypto. Not the answer you're looking for? Browse other questions tagged mining-hardware gpu-mining cpu-mining asic-mining or ask your own question.